Where do I start today? 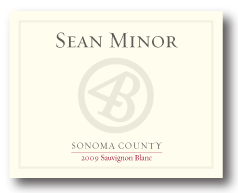 This week my WineGuyMike™ radio show guest is Sean Minor who produces 4Bears Wines from the 4Bears Winery in the Napa Valley of California. I’m excited to share my guests story with you today for many reasons, there is much to share and in my enthusiasm I hope that I can get it all out on the table so to speak. I wanted to start by stating that Sean Minor is a personification of a modern day winemaking warrior, but the term “modern day” seems like such an antiquated term to me in an age where wine and Social Media intersect. 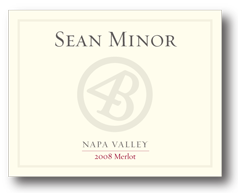 Instead I’m going to say Sean Minor is an in the moment winemaking warrior. In doing research for my weekly radio show I get to meet some very interesting people and my understanding of wine evolves continuously to the point it seems that I have a major epiphany about every other month. Just when I think I might be getting it and then I run into someone like Sean Minor and everything changes for me. How about a little background on Sean? 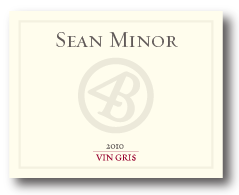 Sean is a young veteran of the wine industry of 22 years. He studied at Arizona State University and received a degree in Finance and where met his wife Nicole. I was excited to see this because my daughter who is going into engineering and is a nationally ranked swimmer is being recruited by the Sun Devils to swim for the university. Me being me I thought mentioning this might bolster the scholarship opportunities, just kidding, well sort of. Are you listening Arizona State, and did you know about the great winemaker you produced at your university? This winemaker started out his career on the management side of the wine world. After college Sean and his wife Nicole moved to the Napa Valley where Sean began his career at Beaulieu Vineyard before moving on to King Estate Winery in Oregon. This eventually led to a appointment at Benton-Lane Winery as President. Sean then was harkened back to the Napa Valley as Manager of Renwood Winery. Throughout this full circle called a career path Sean had been studying at the hallowed grounds known to the wine world as UC Davis where many great winemakers had gone before him. Drawing from all of his career experiences the 4Bears brand was born. This brand name was inspired by the four Minor children. In meeting Sean I have some observations and a few adjectives that I have to share with you and you’ll understand when I also share my newest wine epiphany with you. 1. Sean is extremely professional but is also very real. 2. He is a dedicated family man. 3. Determination, tenacity, perfectionist, extra effort, gets it, produces it, markets it, and delivers it. Yes these are some of the thoughts I took away after meeting and tasting Sean’s wines. Sean and I met at a wine tasting for a small group of restaurateurs a few months back and it was pleasure having him personally take this group through his portfolio of 4Bears wine offerings. The epiphany yes another one of those ah ha moments for me, just when I think I’m getting it I realize I need to pay much closer attention, so here it is. My focus has always been terrior or sense of place in a bottle but after meeting Sean I realized that was only half of the equation. The other half you might ask, a bottle of wine is also the winemaker in a bottle. Terrior plus winemaker in a bottle makes for a really great bottle of wine and this is exactly what Sean has done in all of his wines. This man goes to the great lengths and efforts in sourcing grapes from the best appellations or wine areas available to produce the varietal driven wines that 4Bears Winery offers. Every one of the wines that the 4Bears label offers is as solid as they come and have been recognized at numerous wine competitions as medal winners. Sean selects his grapes from premium vineyards in California that are subject to cool marine influence and the beautiful sunshine that produces incredible grapes from the finest appellations California has to offer. Sean enlists the palette of long time friend and mentor Will Bucklin who also comes from King Estate Winery where he led the winemaking operations. Will now runs his family winery in the Napa Valley. 4Bears Winery currently offers a well rounded portfolio of wines that are undervalued price wise and over deliver in every way when that wine moves from the bottle to your glass. Here is the lineup of wines that I highly recommend that you try, and I’m talking about all of them. Tasting Notes: The Napa Valley Cabernet Sauvignon is ruby in color and displays aromas of raspberry, cassis and cigar box. Once in your mouth, the wine’s silky raspberry fruit flavors and the combination of oak and tannin nuances create a well balanced, rich and full bodied wine that draws you in for more. 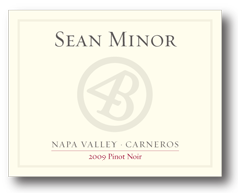 Tasting Notes: The Carneros Pinot Noir is medium-bodied with cherry, strawberry and plum; surrounded by light toast flavors. On entry, the wine displays blue fruit characters that are balanced with spicy and earthy notes that frame the mid-palate. The vanilla and toast integrates well with the silky round tannins on the lengthy finish. Tasting Notes: The Napa Valley Merlot is ruby in color and has aromas of black cherry, dry floral and cocoa. The dark berry flavors along with black cherry and plum nuances integrate well on the pallet with the sweet oak and tannins. The wine provides a full mouth feel which evolves into a lingering and full finish. Tasting Notes: The Central Coast Chardonnay displays aromas of peach, green apples and tropical nuances. On the entry, the wine is soft with green apple, white peach and pineapple notes. The mid-palate displays subtle oak nuances which evolve into a hint of minerality and continue into a lingering clean finish. Tasting Notes: The Sauvignon Blanc is rich and complex with aromas of pears, ruby grapefruit and tropical fruit. On the palate, the combined flavors of pears, fig and melon are balanced perfectly to form a crisp, mouthwatering texture and a lingering finish. The Vin Gris is a bright and vibrant pink color with cherry, strawberry, cranberry and ripe watermelon aromas on the nose. On entry, the wine displays cherry and strawberry flavors with well recognized flavors of Pinot Noir. Raspberry and cranberry fruit characters are balanced with spicy and crisp acidity that linger creating a refreshing and lengthy finish. This wine is produced using the classic saignée method, allowing juice to remain in contact with the Pinot Noir skins for about 24 hours. The juice is then “bled” from the Pinot Noir tank before fermentation begins and inoculated on its own in a separate tank. The resulting wine is fermented dry developing its pink color, aromatics and bright fruit flavors. For my palette I personally love the Pinot Noir and The Chardonnay. The Pinot Noir is unique; the price point is such that you will not find another wine that has this level of sophistication from the Carneros AVA for this price point. This incredible wine and is made 100% from Pinot Noir, it doesn’t need support from any other varietal. Sean nailed it on this one. Let’s get to the Chardonnay which has fallen out of favor for many wine drinkers at the moment. Get over your bad self and try this Chardonnay, it’s fantastic. This wine will appeal to fans of old world and new world wine lovers alike. Sean set out to bring both styles together and offer wine drinkers the best of both worlds and guess what he did it. You will love this Chardonnay, you must try this. This entire portfolio of wine receives the WineGuyMike™ Seal of Approval®, I recommend you try all of these. I know will enjoy this wine flight as much as I do. This week’s WineGuyMike™ Radio Show© Topic; Beringer Vineyards then and now. This week on the WineGuyMike™ show I had the distinct pleasure of hosting Chris Louton, winemaker at Beringer Vineyards. This was a unique opportunity to catch a glimpse of what goes on at one of the premier wine producers in America through the eyes of one of Beringer’s own winemakers. Beringer Vineyards is steeped in tradition to say the very least, it is the oldest continuously working winery in the Napa Valley of California. Beringer was founded by the brothers Beringer, Jacob and Frederick. The two brothers came to America from Mainz, Germany. Frederick who hit the shores of America on the east coast would write to his brother Jacob and espoused the amazing opportunities here in America. Jacob who followed his brother five years later had worked in the wine cellars of Germany. Upon arrival to America Jacob who had heard about the sacred grape growing grounds in California hopped on a train and headed west. He made it to San Francisco and then ventured out to the Napa Valley. What he discovered was hilly land made up of volcanic, rocky, and well drained soils akin to the finest vineyard land in the Rhine Valley. The other thing Jacob Beringer discovered was ample sunshine and warmth that provides the perfect terrior for growing grapes in the Napa Valley. 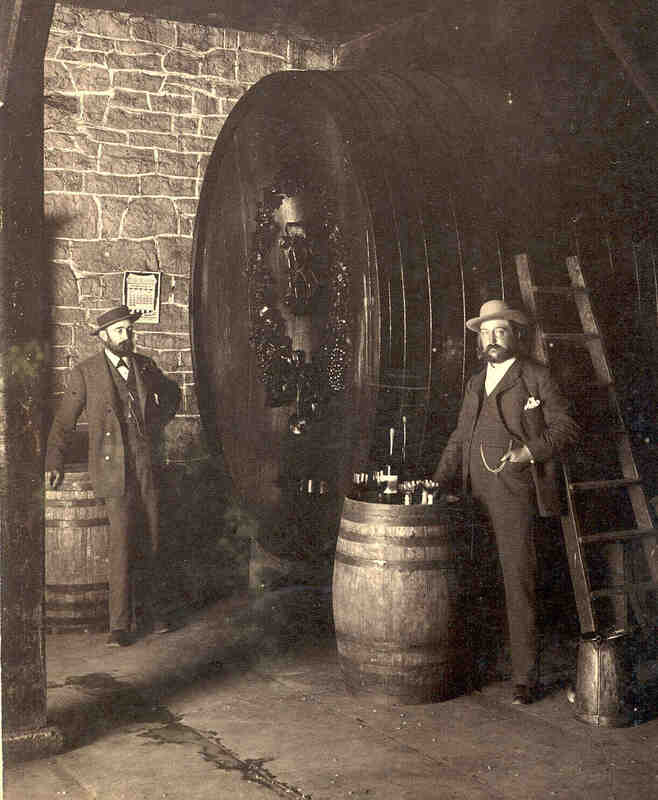 In 1875 Jacob and Frederick bought land in the Napa Valley of California and began growing grapes and producing wine. In 1876 Beringer Vineyards was borne. Jacob took up residence in an existing farmhouse on the property, “the Hudson House” that now serves as the culinary arts center at Beringer Vinyards. Frederick moved from the east permanently and began building his 17 room Victorian house that was a replica of the Beringer family home on the Rhine River in Germany. What is now known as the “Rhine House” at Beringer Vinyards guests can take part in reserve or library tastings at the house. While partaking in these two particular tastings a guest can sit back and look out over the amazing lawns, beautiful gardens and the Napa Valley and ponder what must have crossed the minds of two of the imminent wine entrepreneurs the world has known. Moving forward 135 years as I sit here in the radio studio I now call home with Program Director Dave Cowan I have my head phones on and we dial up Chris Louton assistant winemaker at Beringer Vineyards. I had spoken with Chris the day before and I knew he was going to be a great guest as he was very engaging during our initial conversation. A little background on Chris; he was born and raised in Sacramento, CA., and he Graduated from UC Davis with B.S. 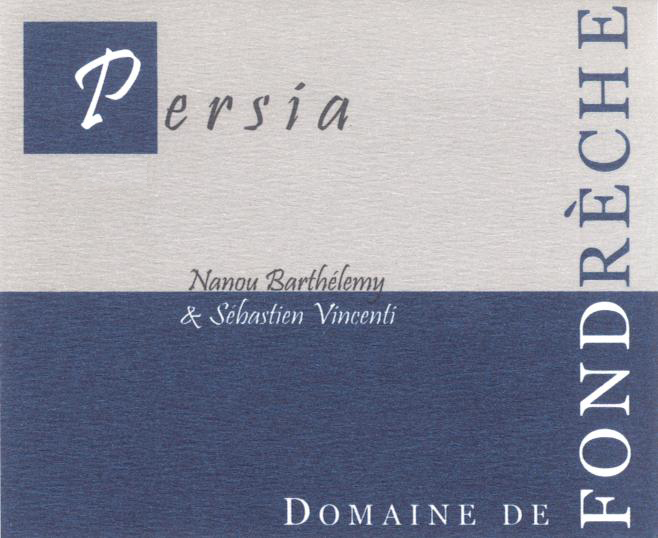 in Viticulture and Enology in 2003. Chris worked as a lab intern at Schramsberg Vineyards for the 2002 harvest, and then returned after graduation in 2003 for another harvest. This worked into a full time position as Enologist and then into Assistant Winemaker in 2004. Beringer offered and Chris accepted a position as Enologist with Beringer in August of 2006, working exclusively with their Napa Valley and Knights Valley luxury wines. 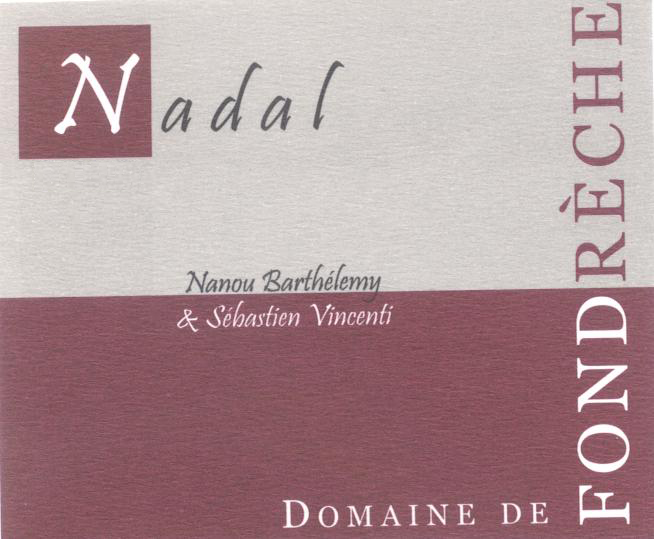 In 2007 he became Assistant Winemaker, overseeing the same products he worked with as Enologist. Chris is married, has 2 boys, ages 5 and 1, he resides in Napa and his family shares the house with 3 dogs and a cat! As I conversed with Chris and he and I recorded this week’s WineGuyMike™ Radio Show© I realized that the past at Beringer Vineyards is what has allowed all the great opportunity for those who make up Beringer as an organization and consumers who reap the rewards. With no pun intended we quite literally enjoy the fruits of Jacob and Fredericks labor. 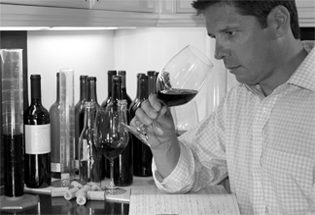 In researching everything Beringer what you quickly discern is their dedication and focus on quality and consistency. In the 135 year legacy of Beringer’s head winemakers there have been only seven which is an average of a little over 19 years each. You also quickly understand that there is a true atmosphere of mentorship, new head winemakers are groomed from the inside of this organization. The blood in the veins of the winemakers at Beringer come from the grapes of their diverse terrior, 15 different vineyards in total. Chris was quick to point out the no other wine property in Napa Valley has the luxury of making wine from the diversity of vineyards and grape varietals that Beringer has to offer. Chris works with the Napa Valley and Knights Valley luxury wines but Beringer offers the consumer wonderful opportunities to enjoy their wines no matter what price point a consumer desires. Some may call this great marketing, I call it thoughtful winemaking. 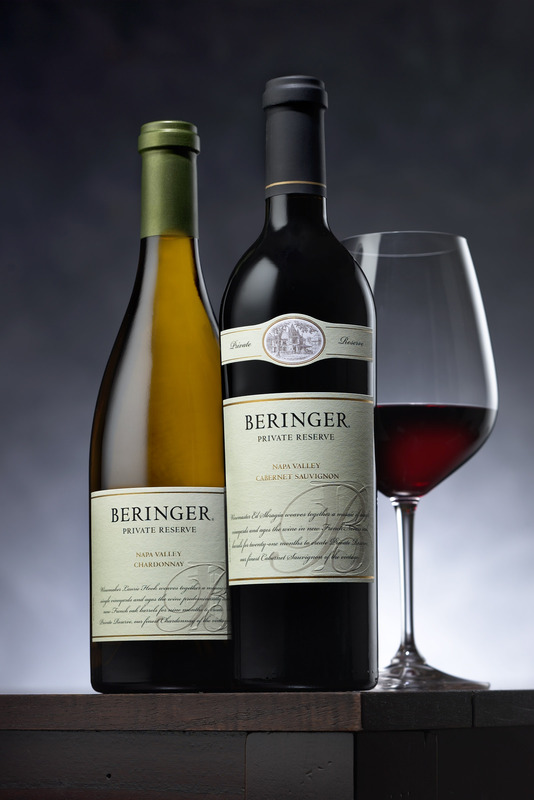 Beringer recognizes today’s wine consumers needs and desires and they have delivered. The teams of winemakers at Beringer have produced six different labels serving all various consumer niches. These lables vary in price from well under $10.00 in the California Collection, from $9.00 -$12.00 price point for the Founders Estates label for those of us who are the everyday wine drinkers, to $20-$30 range for you weekend wine warriors, and for the stratospheric special occasion prices, well at least for most of us, are the Napa and Private reserve labels. The Beringer Private Reserve Cabernet Sauvignon is the utmost expression of each vintage and the terroir of the Napa Valley. The collaboration between winemaking and viticulture has been at the core of the Private Reserve program since the first vintage crafted by Ed Sbragia in 1977. Today, Winemaker Laurie Hook draws on her rich experience of working alongside Ed for over two decades as she blends only the best lots from these outstanding vineyards. Each vineyard is aged separately in new French oak for two years before blending, resulting in a wine of great elegance and structure. A tier focusing on a luxury drinking experience with Napa Valley character and distinction, our winemakers have produced a range of wines with the same inspiration of the original highly acclaimed Beringer Napa Valley Chardonnay – quality and an expression of the Napa Valley. The Leaning Oak wines are only available from the winery, and they fly out of the tasting room door, making them some of our best sellers. The secret to their success is quite simply the quality – these wines offer Reserve level quality at fantastic prices. Distinctive quality that can only be created from the rustic, unspoiled vineyards and unique alluvial soils that makes up Sonoma’s Knights Valley. Located 17 miles northwest of the winery, the Knights Valley vineyard has volcanic, well-drained soils that are perfectly suited to Cabernet Sauvignon, Sauvignon Blanc, and Sémillon. Founders Estate – Chardonnay, Zinfandel, Cabernet Sauvignon, Sauvignon Blanc, Merlot, Pinot Noir, Pinot Grigio, Riesling, Shiraz. This is a terrific flight of varietals that offer the consumer tremendous value. Everyone will love the Founders Estate label. Beringer’s California Collection wines are carefully handcrafted to deliver the outstanding quality and rich flavors that are hallmarks of the Beringer winemaking team. This collection offers a wonderful array of smooth and refreshing wines, and each wine has a youthful exuberance that appeals to anyone looking for an easy-drinking wine that pairs well with a variety of foods. I recommend visiting Beringer Vineyards if you visit the Napa Valley. 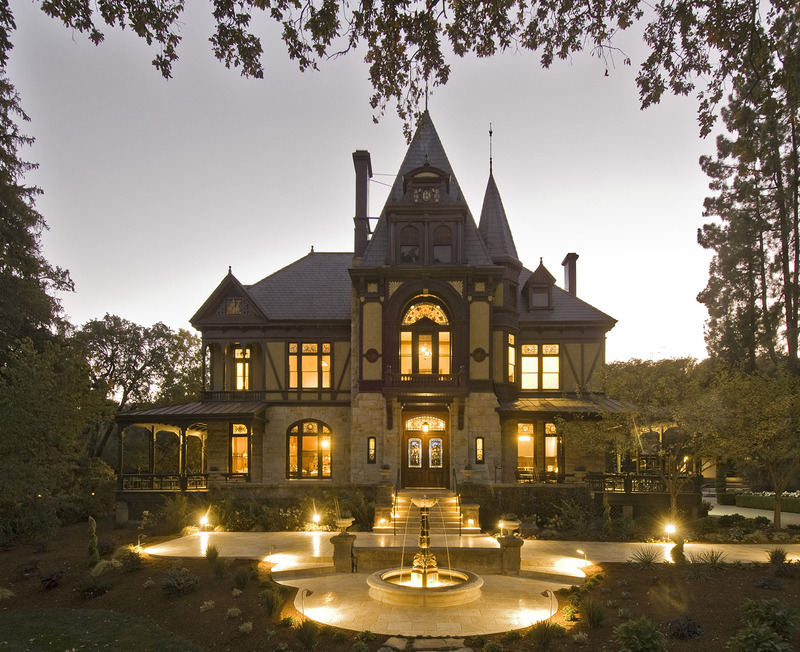 When you conger up a vision of a romantic wine property in your mind, Beringer is that place. Everything about this property is absolutely pristine, and hey did I mention these guys make incredible wine. From a consumer standpoint I love Beringer Vineyards as they have really delivered tremendous value at every price point of wine consumption. They are not an elitist organization that has ignored any consumer; they produce great wines that provide great value for everyone. I for one truly appreciate this approach and that’s why I not only recognize Beringer as having a great marketing plan, I as a consumer wine advocate chooses to call Beringer Vineyards thoughtful. Beringer Vineyards and all of their wines receive the WineGuyMike Stamp of Approval™. I recommend that all of my audience try Beringer wines. I want to give a shout out to Chris Louton of Beringer Vineyards for making time to share his work and passion with my radio audience, thanks Chris. This week’s WineGuyMike™ Radio Show© Topic; Wine and Cheese, we’re talking about a old world medium bodied red wine and a crisp, dry, new world white varietal wine that pair well with the cheese we are enjoying on the show this morning. Old World wines from Europe typically dictate the type of grapes grown, how the wines are made and in some cases the amount of grapes harvested. A New World wine that is not from Europe is typically defined by geographic areas but do not interfere with grape growing, picking, or wine making. Now this is an entire study unto itself but this is the much abbreviated version. 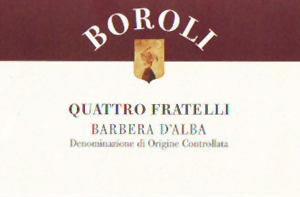 Boroli “Quattro Fratelli” 2007 Barbera $14.00-$16.00 – from Piedmont, Italy – this is a great transitional wine, stepping out from new to old world for the adventurous palette looking to broaden their wine horizons from perhaps a Merlot or Zinfandel. This wine typically scores in 90 point range on a scale of 100. Barbera is a red grape variety of Piedmont origin which has seen great results in the past twenty years, becoming a favorite of wine lovers all the world over. The Boroli Barbera grapes come from vineyards in the area of Alba, with a south-east and east exposition. The vines are trained in the guyot method and are planted at a density of 4,000 plants per hectare. Moderately aged, the wine is harmonious and fruity, an easy drinking wine. “Quattro Fratelli” refers to the four Boroli brothers, and was named by Achille Boroli, the third of the four brothers! The color of Boroli “Quattro Fratelli” is a very intense, ruby red. On the nose it offers aromas of ripe forest fruits and undertones of vanilla. While on the palate this wine is close-texture, mouth-filling with aromas of ripe raspberries and blackberries. There is a nice balance of fruit, acidity, and tannins for followed by a long-appealing finish. This wine was barrel aged for 6 months and bottle aged for 6 months. This wine is great to drink now but will also improve with 2-4 years of aging. The Quattro Fratelli pairs perfect with pasta dishes, meat, sausage sauces, red meat, braised, stewed, or lamb on the spit. It is also ideal with medium ripe, highly-flavored cheeses, such as hard Bra cheese, Grana Padano, Monte Veronese and cheeses from the South of Italy. 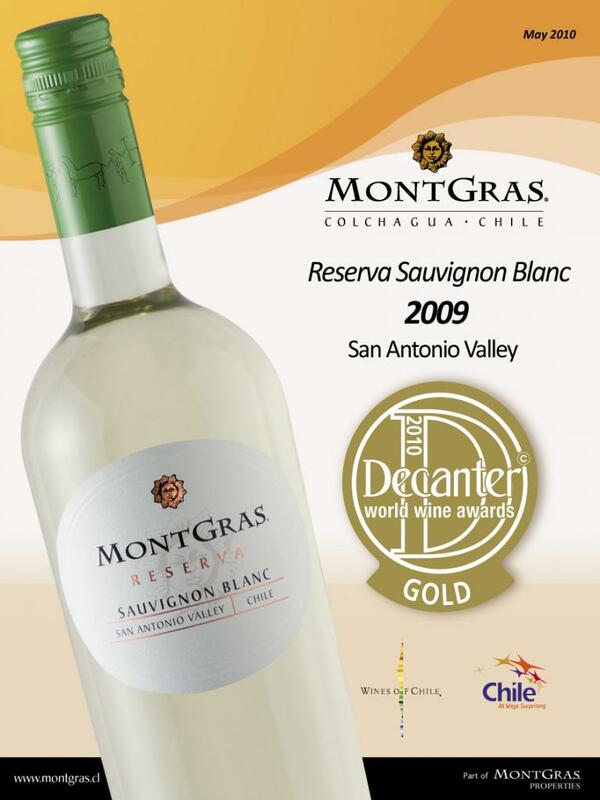 Mont Gras Reserva 2009 Sauvignon Blanc $10.00-$11.00 – This is a great value wine from Chile. Sauvignon Blanc from Chile is as good an example of the best the Sauvignon Blanc varietal has to offer from the new world of wines. The Mont Gras has great balance of citrus fruits(lime), tropical(passion fruit), green apple, and hints of Jalapenos. This wonderful wine is pale straw in color and typical to a new world Sauvignon Blanc this wine has been aged in steel barrels to preserve the fruit and crispness of the wine. This is a wine that is easy to love because it drinks so beautifully. Sauvignon Blanc weather is on its way, Punxsutawney Phil told me so and mentioned this great all around food friendly wine that I’m recommending for you today. WineGuyMike wants to share his two favorite cheeses from The Rogue Creamery, Caveman Blue and the Rogue Creamery Smoked Blue. If you’re a blue cheese fan these are some of the finest in the world. The Caveman Blue is different than many blue cheeses as it is soft, almost spreadable, but has a slight grittiness, pungent(in a great way), and beautiful in your mouth. It has nuances of beef and bacon & grass and hay, and is firm & lower in moisture with a natural rind featuring extensive blue mold development Paired correctly it brings out the incredible nuances of the cheese and wine. The Rogue Smoked Blue is also one of my favorites, this is firmer in texture compared to the Caveman but is no less interesting. It is a great blue with a strong but with an ever so nice smoked nuance. I love this cheese with sliced Braburn apples and wine, wow now that’s a meal unto itself. WineGuyMike™ wine recommendations to go with these great Rogue Creamery Cheeses. I chose two wines today to share with you because they are wines that are readily accessible and offer the consumer great value. These two wines taste great and paired with the two cheeses I’ve selected to share with you they bring out the very best in one another. I give both of these wines The WineGuyMike™ Seal of Approval©. Getting oxygen to the wine brings out the bouquet and aroma in a wine, so swirl away. Smelling the wine may be the most important part of tasting a wine. Most people can recognize over two thousand scents. Did you know that wine has over two hundred discernable scents of its own? Examining wine held up to a light looking first from the bottom of the wine glass up into the wine will help you determine the color of the wine which also helps determine the “age” and “stage” of the wine you’re drinking. Holding the wine at an angle look at the surface of the wine you’re drinking and examine the viscosity of the wine, which is what appears to be the layer of oil on the surface of the wine. If it is thicker or heavier this denotes a wine that is fuller and will have a heavier, fuller mouthfeel. That is the texture you actually feel of the wine in your mouth. A wine with a less viscous surface you will note that is feels much thinner and lighter in your mouth. The viscosity is also what causes the legs of the wine to run quickly or slowly down the inside of your glass after it has been swirled. Next take a small sip of wine and pucker your lips, then gently breathe in. This aerates the wine in your mouth, even swish the wine around a bit. This really brings the wine to life so you can experience everything the wine has to offer your palette that the winemaker intended you to sense in their wine that they have made for you. We can sense four different tastes and possible five but that is still debatable, and they are; sweet, bitter, salty, sour, and perhaps an ability to sense MSG otherwise known as umami. Our mouth also has an ability to “feel” cool, warm, dryness, tingling, a coating feeling, and a feeling of numbness. Wow there is much to think about when drinking wine isn’t there, just remember not to over think it, it was made to enjoy. If a wine has been well made it will be like a great movie. The memory or finish lingers, a cause to ponder and then lust for more. You just had a great wine, cheers to you from WineGuyMike™.